If you are looking for authentic and everlasting travel experiences in both Ecuador and the Galapagos, you will find our tours just perfect. We have been in this business since 2006 and we consider ourselves experts and adventure lovers. So we are always looking for innovative and creative ways to help you plan your trip in the best way possible. Nature Galapagos & Ecuador and San Vicente Group consortium is a local tour operator, owner of San Vicente Galapagos Hotel & Laguna Galapagos Hotel. Our headquarters are both, in Quito, Ecuador and on Isabela Island, Galapagos. Comments for Nature Galapagos & Ecuador Cia Ltd. Deep sea diving is one thing that I have never tried before. I always wanted to do so. When a friend of mine asked me to accompany him on a deep sea diving tour, I could not resist the temptation. After a long research and few rounds of talks, we booked out travel package through Nature Galapagos. We had a great time swimming along with various marine creatures like Galapagos Hammerhead sharks and Giant Manta Rays. Our tour was designed in such a way that it felt like it was customized for us. 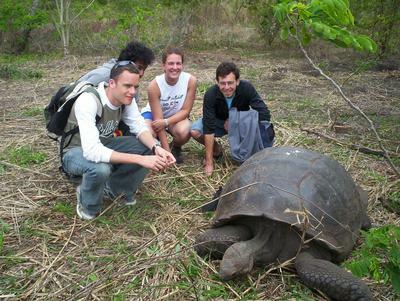 Nature Galapagos provide the best tour packages of Ecuador. Keep up the good work guys.